The library building in Youth Park in Taipei's Wanhua District is a small unobtrusive structure half-hidden by spreading green trees. Painted white and bare of decorations, it hardly catches the eye of the casual passerby. Yet this modest two-story building, constructed in 2012, attracts an average 100 visitors a day all year round. Most of the visitors are people seeking ideas for green building and energy conservation, according to the designers, Wei Jen-cheng (韋仁正) and his wife Hu Hsiang-ling (胡湘玲). The library is a showpiece for the couple, who have been working for more than 20 years to promote the concept of sustainable building in Taiwan, and it is about to become a classroom for the practical education of students interested in such ideas. "Every graduate of our school will have the ability to build a house from scratch," said Wei, who will be the principal of HAND Architecture and Building School when it opens in September. He said the three-year curriculum will include on hands-on construction work and the study of architectural principles and will end with a certificate of completion of experimental education at the senior high school level. The students will also be taught German, said Wei, who spent many years in Germany with his wife and has great admiration for the lifestyle and building concepts there. "It's a lifestyle of keeping your feet on the ground and dealing with issues in a pragmatic way," he said. He said that when he and his wife bought a historic house in Germany in 2001, the residents of the community pitched in to help with the restoration and maintenance of the building that dates back to 1843. Drawing on their experience in Germany, Wei and Hu have designed and helped construct several sustainable buildings around the world, including a shelter for displaced victims of the 1999 Jiji Earthquake in central Taiwan. On that project, some 300 volunteers joined the effort, taking up the challenge of trying to improve their own lives by working together, sharing ideas, and jointly solving problems, all at the community level, the couple said. That is the kind of spirit Wei and Hu are hoping to foster at their new school, which has been established in line with the Taiwan government's Act for Institutional Experimental Education. "Our core objective is to nurture the 'spirit of artisans' and help students develop a passion for and dedication to their work," Wei said. In addition, a high level of hands-on participation in new building projects will give students the experience of creating something tangible and hopefully will help shape a more practical approach to life, something that is sorely needed in Taiwan, Wei said. "People in Taiwan talk too much and do too little," he said. "We want to change that, from an educational perspective." So far, about 30 students have applied for admission to the school, which Wei sees as a satisfactory number since the relevant law in Taiwan limits the number of students at such three-year experimental educational institutions to 125. He said the long-term goal is to promote sustainable building through a curriculum that focuses on smart energy use and environmentally friendly construction methods. The students will have before them a classic example of sustainable architecture, as some of their classes will be held at the building in Youth Park. The Solar Library and Energy-Optimized House, as the structure is called, was designed by Wei and Hu, who also helped build it in 2012. The 440 square meter two-story building is 80 percent more energy efficient than the average residential unit in Taiwan, according to Wei. It has 182 rooftop solar panels, which produce 56,000 kW-hours of electricity per year, slightly more than its annual energy consumption of 55,000 kW-hours, he said. In addition, unlike most buildings in Taiwan, it was constructed with insulation. The walls are insulated with wood fiber and painted with limewash, while the windows are aluminum clad. As a result, the indoor temperature averages 27 degrees Celsius in summer and 19 degrees in winter, the designers said. Sustainable architecture, however, is not just about the right materials and design, Wei said, adding that maintenance is also an important factor. For example, while the aluminum clad windows on the library building keep out the hot air in summer, they must be opened at intervals for ventilation of the rooms, he said. 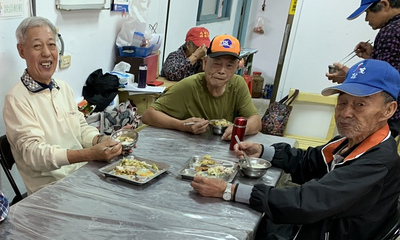 "Taiwanese spend a lot of time inside their houses but make very little effort to take care of them or to stay comfortable, which needs to change," Wei said. As Wei and Hu move forward into the field of providing formal education, their motivation to bring about such change in Taiwan is rooted in their conviction that true success and gains are bound up in the work of one's hands. "The word 'hand' in Mandarin sounds similar to 'sweat and gain,' and that is precisely the philosophy we are promoting," Wei said.